I am in love with these midi circle skirts, i mean they are so elegent and just pure gorgeousness, any season these skirts can adapt to it. We all know they have been around since back in the 50ties...our mothers wore these before us and even back then these skirts were considered to be elegent & classy. 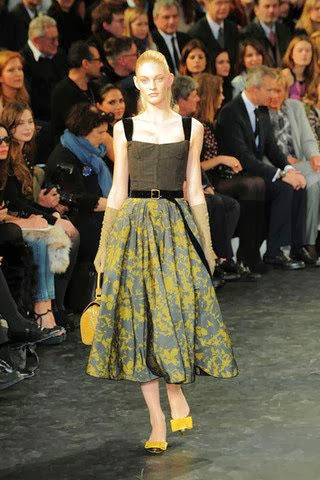 The trend has also been seen on the runway too.... Are you into skirts, would you rock this lovely fashion trend!? Let me know......a lovely weekend to you all my lovely fashionistas mwaah. Im Vee aka Veritas,a mother of a lovely babygirl & a fiancee...Im a lover of fashion,music,art,technology,cooking,kids & all things beautiful. This is my space 2 share with yall my addiction to this industry. Enjoy!! Do you dress up for your body shape !?! Your browser does not support Style Tags. SkirtsDressesandStilettos © 2013 All Rights Reserved. Simple theme. Powered by Blogger.